As with other states of India and being ancient historical records, Gujarat is very traditional state. The inhabitants of Gujarat are very concerned about their value system. They still use their ancient art and craft techniques with great willpower. People of Gujarat are proud of their customs and traditions and follow them with greatest enthusiasm. They are very simple and celebrate varied fairs and festivals. Kite festival, Modhera dance festival, Kutch Utsav, Bhavnath festival Mahashvratri, Holi festival, Chitra- Vichitra fair are some of the fairs and festivals. Kutch Utsav is another important festival celebrated in the Kutch region of Gujarat. The tribal people residing in the state have their typical customs and rituals. Thus, Gujarat has a cultural diversity which is an exceptional attribute of the state. People celebrate different festival with traditional dance and music performances. This state has a rich tradition of performing arts. Gujarat is a state of music lovers and has produced some of the best musicians of India such as musicians Baiju Bawra and Tana Riri. The people of Gujarat are commonly referred as Gujaratis and the main language spoken is Gujarati. Most popular dances of Gujarat are Ras and Garba. Some other popular folk dance forms include Tippani Nritya, Siddi dance, Padhar Nritya, Dangi Nritya and other local tribal dances. 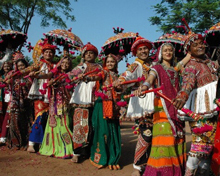 Bhavai is the popular folk drama in Gujarat. Gujarati handicrafts, which are famous worldwide, are also an integral aspect of the culture of Gujarat. The Arts and Crafts of Gujarat have great significance from aesthetic as well as business point of view. The main arts and Crafts of Gujarat include embroidery, printing, wood carving, stone work and jewellery. 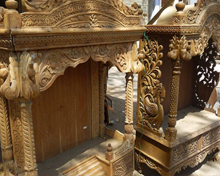 The Surat based 'zari' industry is extremely popular among all and sundry. Stitched on silk or satin, the Ari embroidery is an old form of the genre, where an awl is used instead of the usual needle creating heavy colorful designs. Wood carving is very stylish woodwork, undergoing a process of laborious etching into country woods creating beautiful designs of animals, trees, flowers on lamp shades, toys, and showpieces. Also inlay work is done with agate, a varied colored material and mostly got in Khambhat.